These guys and other prophets said it, but so much time had passed before it would actually happen, that I wonder if maybe God’s people “said” they hoped and believed it would happen (because that’s what they were supposed to hope and believe), but had long since “lived” as if it were never going to happen. I wonder if they began to place their hope in things other than the Messiah to fill their void – things like a happy marriage, healthy kids, a good job, or a government that favored their opinions. Jesus the Messiah was born in Bethlehem just as Micah had prophesied, and about 30 years later, He was baptized by His cousin John, He called His disciples together, and He taught about God’s love and God’s Kingdom while doing miracles for 3 years. The hopes of many of God’s people—at least the non-religious ones—had been renewed. As the hopeful crowd celebrated by throwing down palm branches and shouting, “Hosanna!” (which would be like us shouting, “Lord, save us!”) surely they imagined their Messiah to be a ruler who would make their daily lives easier, and who would end their suffering, and who would wipe out their enemy—the mean Roman government. But their expectations were a bit off. Within just hours, there was Judas’ betrayal, Peter’s denial, a faulty trial, and a horrendous crucifixion. Their hearts and their hopes were splattered. 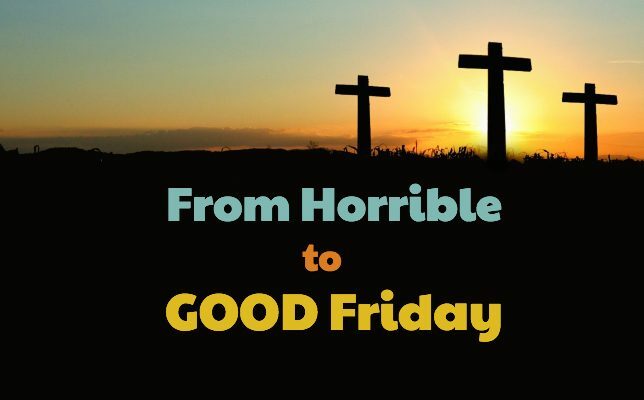 This week, in the midst of great-celebration-turned-great-disappointment in just one area of my life, as I tried to think happy thoughts, my mind kept drifting to just how devastated those closest to Jesus must have been the day He was laid in the tomb. All their hope that had blossomed over the previous three years now lay dormant in a tomb being guarded by the enemy’s soldiers. I can’t even imagine their misery. Their grief. Their questions. Were we foolish to believe in and follow Him? The resurrection changed everything. The tomb was empty. Jesus had conquered death. Hopelessness turned to celebration. Anxiety turned to peace. Doubt turned to trust. Religion turned to relationship. Lack of purpose turned to a mission worth dying for. I wrote that last paragraph sincerely believing and clinging to every word of it in my head. And maybe I should just end this post here with a big Easter “Hip Hip Hurrah!” praying and trusting that my heart will soon FEEL these reactions to the truths as much as my head THINKS them. “Wrestle” is the key word. Here are three resurrection truths I’m wrestling to keep front and center in my heart and mind this week. #1 HE is the Resurrection. Jesus said that He was the actual resurrection. He pointed to Himself and not to a program or a process. That reminds me that if I want my joy (or hope or peace) to be resurrected, I will find it in Him. In who He is, not in what I do. I want to cling to Him more. I want to WANT Him more. For the 23 hours we had Benjamin, nothing else was more important. I didn’t even think about the sump pump that needed to be fixed, the bald car tires that need to be changed, or our taxes that still need to be filed. Granted, we would’ve had to think about them eventually, but those items along with other smaller “worries” that were stealing my joy the days before, weren’t even on the radar. That happens when you’re awestruck with something much more beautiful that’s right in front of you. Jesus, I want to be way more awestruck with You. Fill my heart and mind with Your praise. Help me to let go of stuff that steals my time away from just being in awe of You. Amen. #2 His power is our power. He’s given me the power. I just need to use it. #3 We can trust His sacrificial love. There was Benjamin, this 4 pound 11 ounce little burrito that was sure to make us lose money, lose sleep, and lose freedom in our schedule. He couldn’t do ANYTHING for us, and yet we were smitten by him, and were ready to give up everything for him. And for the first time, I got a greater glimpse of the love of our Heavenly Father, who is way richer in mercy than my mind can comprehend. God’s willingness to send His Son, and Jesus’ willingness to die a cruel death, and their power to pull it off and defeat death to demonstrate their love for us—these truths fill my heart with a gratitude that I hope will always outweigh any disappointment or even legit suffering this temporary world throws my way. The more I reflect on this sacrificial love, the more my heart is healed by it. Lord, please help me to hide these truths in my heart. Help me to cling to You. Help my gratitude grow for Your once-and-for-all sacrifice that You made out of great love for me. Help me to remember that You have given me all kinds of power that I just need to use. Help me to introduce Your love and power to others who have gone and are going through much tougher trials than mine. Thank you for showing me that even in the midst of that first Good Friday, the story was no way near over, and the best was yet to come. Amen.